With a design said to have been inspired by a question mark scribbled on the back of an envelope, BBC Television Centre is one of the UK’s most recognisable cultural landmarks. 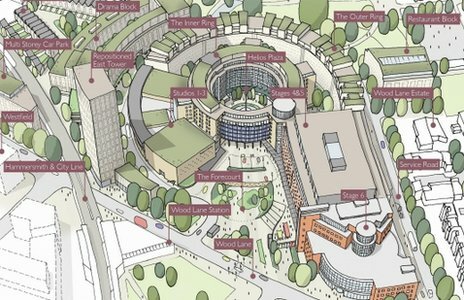 The site sold for £200m last year to be redeveloped into a hotel, flats, a cinema and office space. The three main television studios will be refitted and leased out to production companies, including the BBC, from 2014. The 14-acre site will also house the BBC’s commercial arm, BBC Worldwide. Some of the best-known programmes on British television were recorded within its walls: Dad’s Army, Fawlty Towers, Top of the Pops, Monty Python’s Flying Circus, The Two Ronnies, Blue Peter, classic era Doctor Who and Absolutely Fabulous to name but a few. Designed by Graham Dawbarn, Television Centre was built in 1960 on the site of the Franco-British exhibition of 1908. Its distinctive circular main block – which housed the studios, dressing rooms and offices – was known to staff as the “doughnut”. The story goes that Dawbarn came up with idea in the pub after he drew the triangular shape of the building site on the back of an old envelope. Doodling a question mark in the middle, he realised it would make the perfect design.